When in family party, close friends date, friends visiting, we may supply them with warm coffee that we made by ourselves. 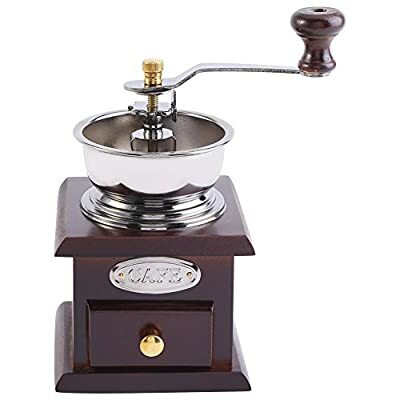 Our product is the manual coffee bean grinder. It can grind fine and nice coffee powder for you make coffee. Easy to use. You can say good-bye to instant coffee. Good product at competitive price. Don't hesitate to buy the fabulous item. Note: The coffee grinder is adopted iron core, and no screw cap to fix. Please always rotate grinder handle clockwise. Other wise the device will fall apart. Vintage Design: Retro and classic is the most representative features of the manual coffee grinder. It's made of wood & iron core. Environmental protection, no pollution, wear resistance. Non-toxic and safe to use. The coffee grinder makes grinding powder even. Labor-saving design of the coffee bean grinder, easy for your to make coffee manually. Retro style design, a nice home kitchen decoration. Kindly pls note the coffee grinder is adopted iron core, and no screw cap to fix. Please always rotate grinder handle clockwise. Other wise the device will fall apart.